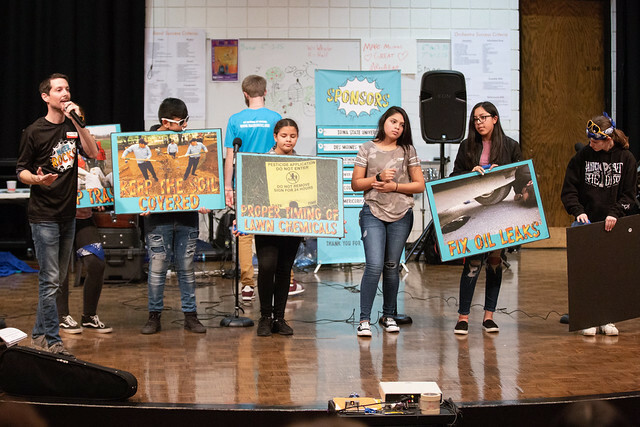 Science and music staged a dynamic duet during a pair of assemblies at McCombs Middle School on Monday that it’s tempting to describe as splash mobs. Water Rocks! is a roadshow that barnstorms the state, spreading the increasingly critical gospel of environmental stewardship packaged in a lively format that encourages audience, i.e. student, participation. The wet weather outside was perfect for a tutorial about the process by which rainfall inexorably winds its way to rivers, streams and oceans, gathering a little bit of everything in its path along the way. Through a combination of STEM and the arts (STEAM), Water Rocks! educates and entertains young people toward a greater appreciation of the state’s water, soil, and other natural resources. McCombs 8th graders joined the traveling troupe cast as trash, soil, fertilizer, pesticides, motor oil and, the role of a lifetime, manure for a skit that concluded with two musical selections, Rollin’ to the River and Scoop That Poop, a ditty for dog-walkers to hum as they make their daily rounds. Assembly audiences are encouraged to move and make noise throughout the performance/lesson while absorbing knowledge about watersheds and what’s happened to them because of industrialization. It’s as clear as Iowa rivers were early in the 19th century that those rivers are now fouled and in need of preservation measures besides the treatment they receive via public utilities like the Des Moines Waterworks. The opening ensemble number is an energetic paean to the star of the show – water. Like the song says, “It gives life to us all, so let’s have a ball…” And learn a thing or two, too! Partners of Water Rocks! include Iowa State University Extension & Outreach, the Iowa Department of Natural Resources Leopold Center for Sustainable Agriculture and the Des Moines Waterworks. For more information about how to bring a free but valuable lesson kit to your school, visit the Water Rocks web site.